After reading our Borax review, I’m sure you’re excited to give it a try and see how great the results are like we did. 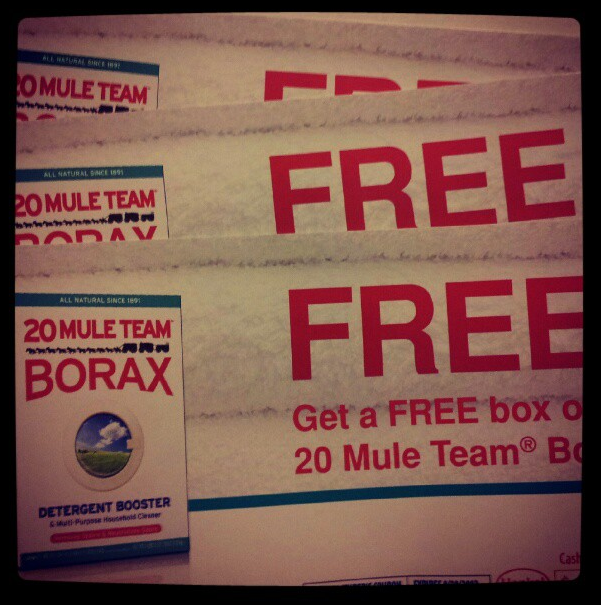 We are giving away 3 coupons for a FREE box of 20 Mule Team Borax. We will randomly choose 3 winners so each winner will receive a coupon for one free box. Giveaway is open to the US and Canada (if you can use the coupon in your area), ages 18 years of age or older. Giveaway ends January 18, 2012 at 11:59 pm EST. Enter to win via the entry form below. Good luck! Borax provided a free sample of their product so I could review them. However, all of the opinions expressed here are my own. I learned their Detergent Booster makes any detergent more powerful. I have seen BORAX around all my life (I am turning 42 in less than a month) & I never knew what it was, I used to think I WAS laundry detergent but, after watching the videos today, I learned it is an Buffer & I learned the “scientific” way it works with the Alkalinity and pH. Amazing that we learn new things every day. I like that Borax is !00% natural. I read your Borax Review. I have never used Borax before and would love to find out if it works as good on my stained clothes as it did on yours. I never knew that Borax was a natural product and I learned so much from the video! Thanks and Happy New Year! There is no 20 Mule Team Laundry on Pinterest…just pins from other people…it directs you to their 20muleteamlaundry.com site. Just thought you should know. I have always used 20 Mule Team as a laundry booster and household cleaner – but I did not realize it was controlling odors too – good to know! Thanks! I make my own laundry detergent with Borax . That with the Goop for grease stains I never tried yet – but I get alot of them kind of stain in my house. I like that its all natural too. I like the face that Borax controls laundry odor and house orders. I love this product big time!!! 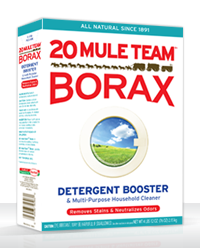 20 Mule Team® Borax increases your detergent’s power and controls odors to give you fresh, clean laundry. I learned that borax is a natural product that softens the minerals in water so that your clothes come out cleaner. It kills odor in your clothes and keeps your other clothes from being stained by dirty ones. It is all natural & boxed in the USA. That: When you add detergent to hard water, some of the detergent combines with the calcium and magnesium granules that settle to the bottom of the washing machine, where it washes harmlessly down the drain without cleaning your clothes. Interestingly enough, I don’t live far from Boron, where Borax comes out of. I use it in my home made laundry detergent. Works great! That it is all natural and helps fight stains and it eats odors! I didn’t realize it had so many uses. Goop & Borax… sounds like a good duo. I learned that you can use Borox in making your own candles to help reduce ash and smoke problems. I learned that Borax is all natural and has been around since 1891. I’ve been using Borax for 3 years now 🙂 I use it in every load of laundry and to clean various things around the house. I learned it softens the minerals in laundry water to get cloths cleaner. I use Borax in my homemade laundry detergent. I didn’t realize it was all natural. I learned that it’s one hundred per cent all natural. I have eczema that is constantly acting up in one place or another. I would like to see if borax would help in my laundry or not. I learned on the borax website that it is o.k. to use in my High effeciency machine. I learned that Borax is all natural and made in the US! found out it’s natural and can be used for soooo many uses. Besides using 20 Mule Team Borax to help clean and freshen your clothes, you can also preserve flowers by combining the borax with corn meal. Who would have thought. I learned that it is all natural. A GREAT product in my books. After reading your review on how you removed the stains I learned that you used Goop and lots of it. Worked like a charm. I read the review on How to Get Grease Out of Your Jeans and was pleased to hear about your success with grease removal. My son is constantly coming home with grease on his clothes, I’m going to give your method a try because like you, I also have very hard water. I love borax, all natural remedy for ants and much more. I learned that Borax helps with hard water. I defiantly need that! It’s natural, fights stains and odors. WOW!! I learned that Borax is a natural product! I had no idea! I LOVE Borax! I use it in my homemade laundry detergent! I like that it is a natural product. I learned how to get tough stains out of jeans. i love that borax can be used in so many ways! I did not know it was made in the USA and was all natural. I learned that Borax softens hard water. Rub some “Goop” into the stains, let sit, then wash adding borax to the detergent. I LOVE that Borax is 100% Natural and it works well for my “green” home. I’ve used it for quite a few years and will continue to use it! I like that it helps with odor control! Borax is all natural and been around for over 100 years. I use Borax, so I already knew how it works. The history of the company was interesting to read, and I didn’t know it was mined though. I like that it is a natural product – I use it because it works! Loved your review because the experience you had with the grease stained jeans is similar to an experience I had with Borax – my son-in-law couldn’t believe I got the stain out of his shirt! I hate doing laundry and it’s weird, but I am SUPER picky about how it is done. One of the things I NEED to have is clean-smelling laundry. It is nice to know that Borax is not only a long-time sold and trusted product, but also controls odors as well. They have been making the product since 1891. It is all natural since 1891! I like that BORAX is All natural! it has odor control and its all natural. I learned that Borax is a natural product. I use it to make my own laundry soap and save money. It helps control odor. Thanks for the giveaway. I learned that it softens hard water……which I did not know. Your review on Borax was informative and has convinced me to buy some and give it a try! I like that it can be used for more than just laundry. I like that it is all natural with odor control. It increases your detergents power and controls odors. 20 Mule Team Borax comes from California where one of the world’s largest deposits was discovered in 1913.